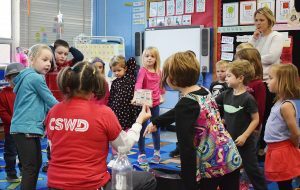 CSWD provides a variety services to Chittenden County schools at no cost, including programs, activities, field trips, and technical assistance. In addition, CSWD services can also be tailored to your needs. Get in touch with the School Outreach Coordinator (see contact information above) to discuss your idea and see how we can serve you. Choose from a number of different fun and interactive programs, ranging from “Trash Talkin’ & the 3 R’s” to “What Goes Where?” to “All About Paper” and much more. Many Next Generation Science and Common Core State Standards can be met through CSWD’s programs and activities. CSWD facilities collect, process and manage thousands of tons of recyclables, compostables and trash every year. A tour of one or more of our facilities gives you a behind-the-scenes look at how we handle it all. CSWD provides an array of expertise, programs, and information to aid schools in improving their sustainability. 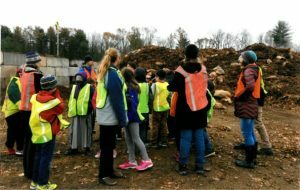 Registration now open for 2019 Recycle Rally! Help your school learn what goes in the recycling and trash bins while activating student engagement through this fun competition! We are inviting all Chittenden County K-12 schools to see who “Recycle Right” the best. Learn more & register on our Recycle Rally page. Rhonda is full of positive energy and is engaging with students. She was fast paced and related to the kids every step of the way! I honestly expected a dry, over-the-kids-head presentation, but it was NOTHING like that! Rhonda is funny, high energy, and makes recycling and composting exciting! Our students really enjoyed the tour. It was very informative, and we were all able to see what happens to our recyclables! Rhonda is a great presenter! She was engaging and fun. She had lots of great connections to the kids and their community that made the information relevant to their own lives. The kids loved the interactive parts [of the 3 R’s Assembly]—especially running the recycle, compost, or trash race.